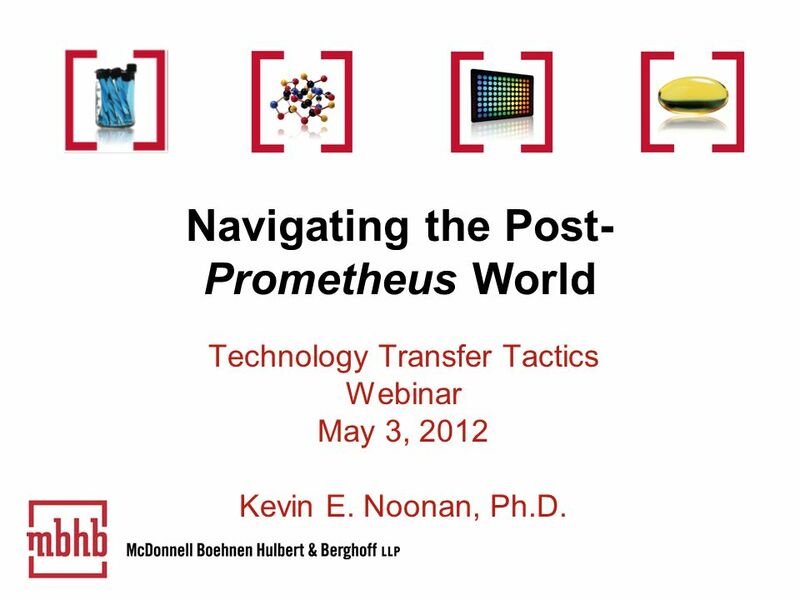 Navigating the Post- Prometheus World Technology Transfer Tactics Webinar May 3, 2012 Kevin E. Noonan, Ph.D.
1 Navigating the Post- Prometheus World Technology Transfer Tactics Webinar May 3, 2012 Kevin E. Noonan, Ph.D.
2 Whoever invents or discovers any new and useful process, machine, manufacture, or composition of matter, or any new and useful improvement thereof, may obtain a patent therefor, subject to the conditions and requirements of this title. 35 U.S.C. 101. 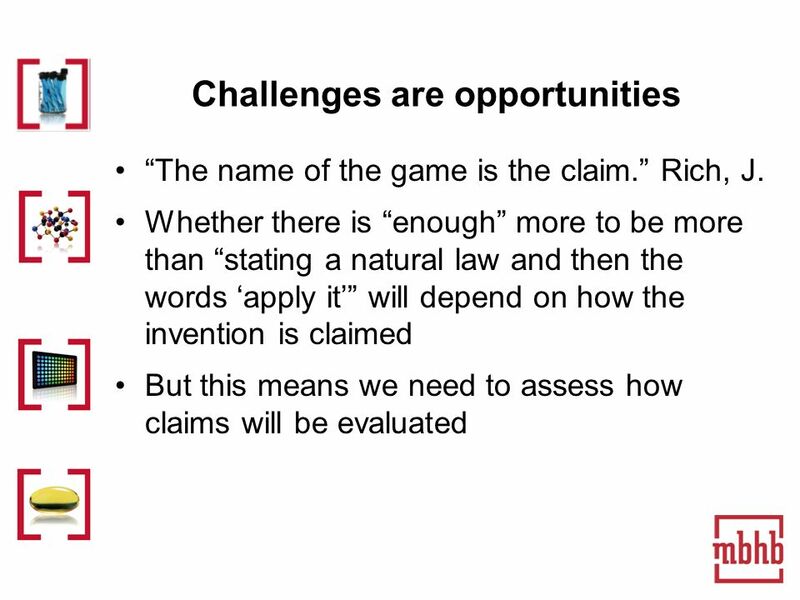 But there is an implicit exception: laws of nature, natural phenomenon, and abstract ideas are not patentable subject matter. 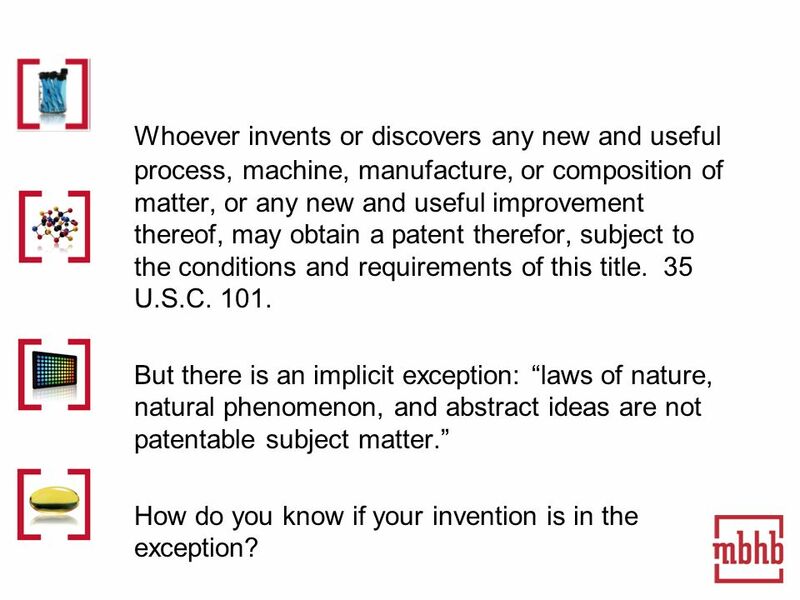 How do you know if your invention is in the exception? 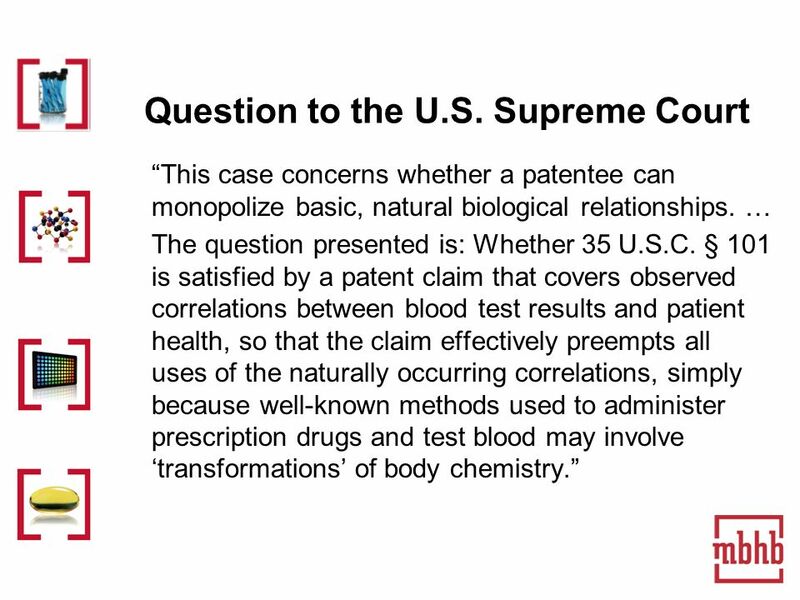 8 Question to the U.S. Supreme Court This case concerns whether a patentee can monopolize basic, natural biological relationships. … The question presented is: Whether 35 U.S.C. 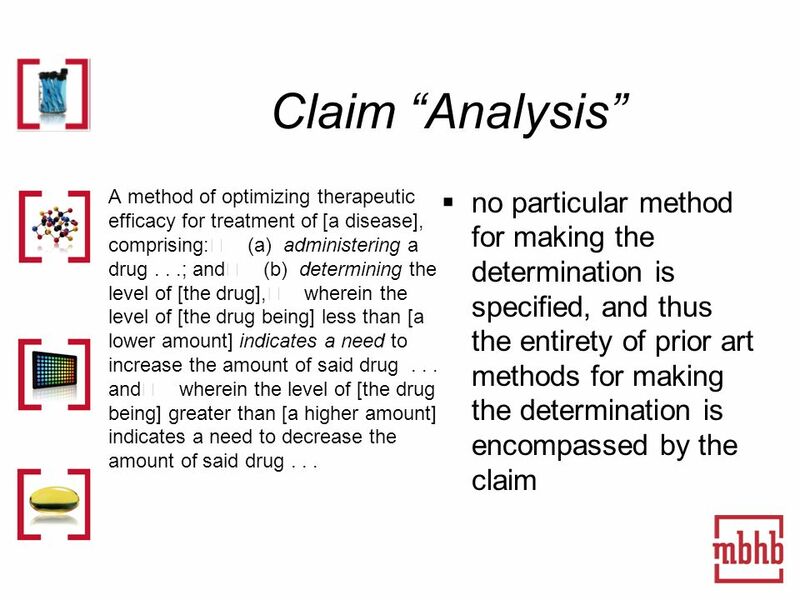 § 101 is satisfied by a patent claim that covers observed correlations between blood test results and patient health, so that the claim effectively preempts all uses of the naturally occurring correlations, simply because well-known methods used to administer prescription drugs and test blood may involvetransformations of body chemistry. 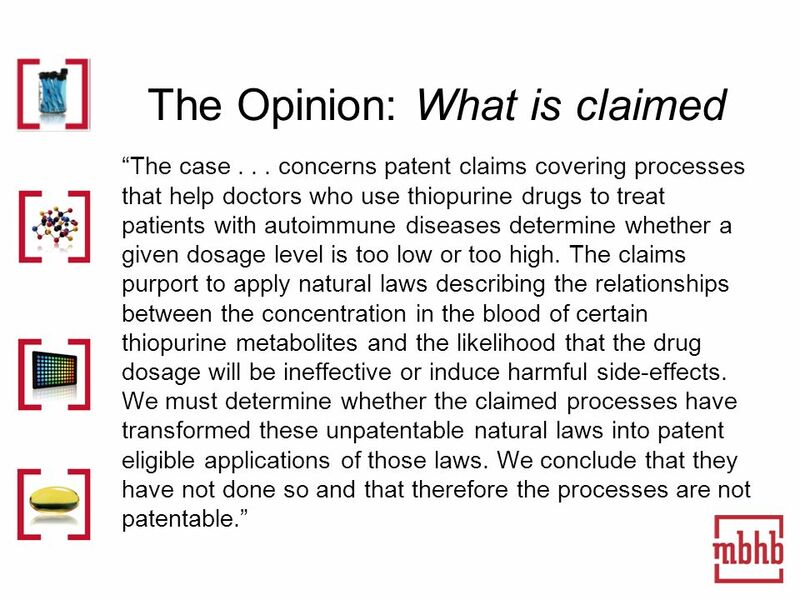 9 The Opinion: What is claimed The case... concerns patent claims covering processes that help doctors who use thiopurine drugs to treat patients with autoimmune diseases determine whether a given dosage level is too low or too high. The claims purport to apply natural laws describing the relationships between the concentration in the blood of certain thiopurine metabolites and the likelihood that the drug dosage will be ineffective or induce harmful side-effects. 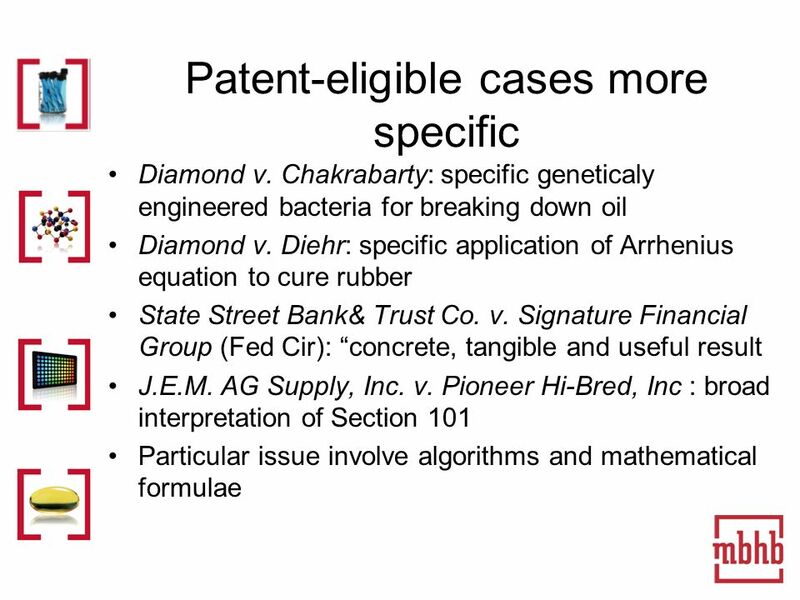 We must determine whether the claimed processes have trans­formed these unpatentable natural laws into patent­ eligible applications of those laws. 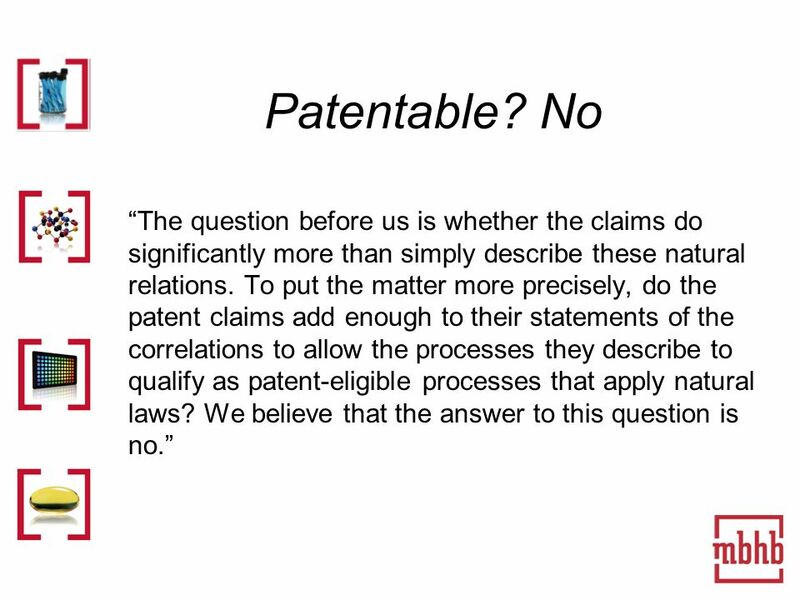 We conclude that they have not done so and that therefore the processes are not patentable. 10 Patentable? No The question before us is whether the claims do significantly more than simply describe these natural relations. 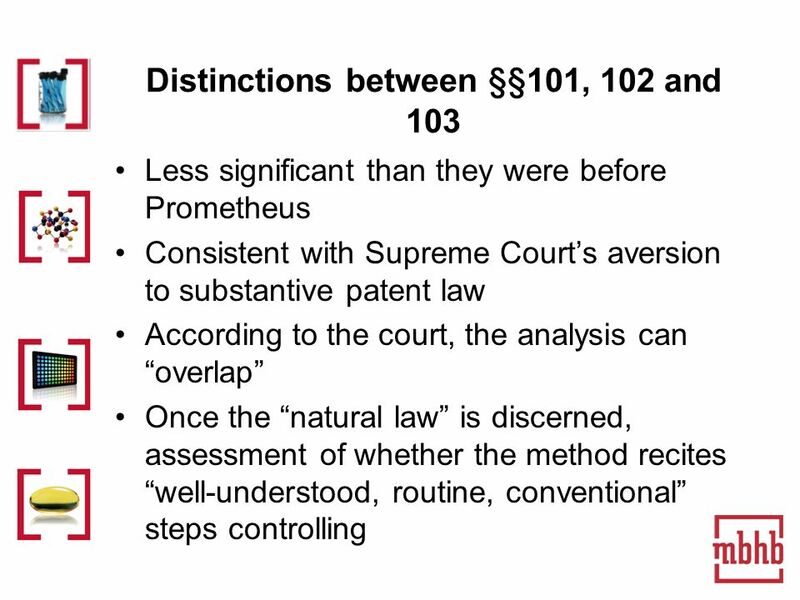 To put the matter more precisely, do the patent claims add enough to their statements of the correlations to allow the processes they describe to qualify as patent-eligible processes that apply natural laws? We believe that the answer to this question is no. 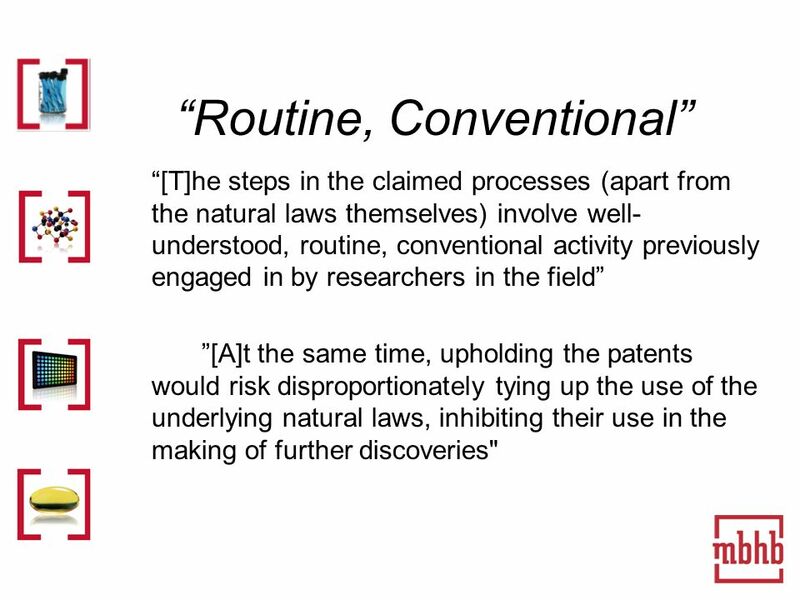 14 Routine, Conventional [T]he steps in the claimed processes (apart from the natural laws themselves) involve well- understood, routine, conventional activity previously engaged in by researchers in the field [A]t the same time, upholding the patents would risk disproportionately tying up the use of the underlying natural laws, inhibiting their use in the making of further discoveries"
15 Routine, Conventional These instructions add nothing specific to the laws of nature other than what is well-understood, routine, conventional activity, previously engaged in by those in the field. 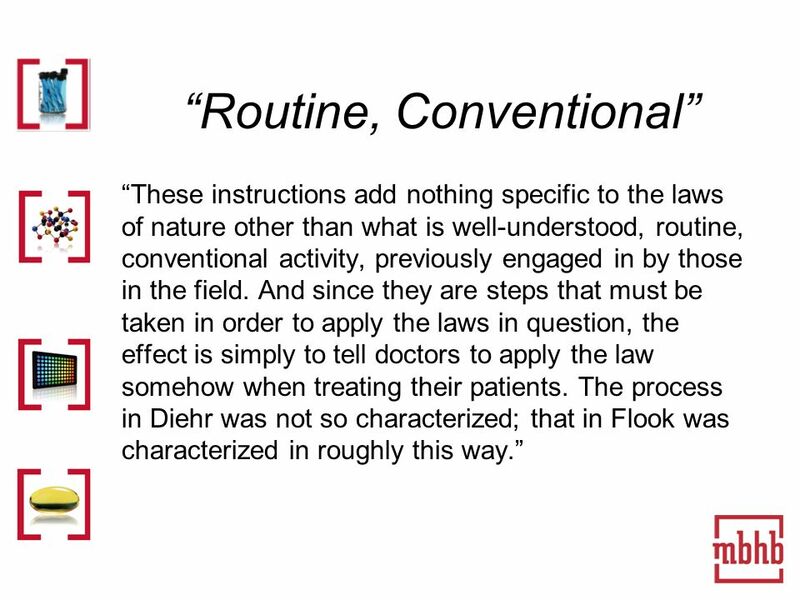 And since they are steps that must be taken in order to apply the laws in question, the effect is simply to tell doctors to apply the law somehow when treating their patients. The process in Diehr was not so characterized; that in Flook was characterized in roughly this way. 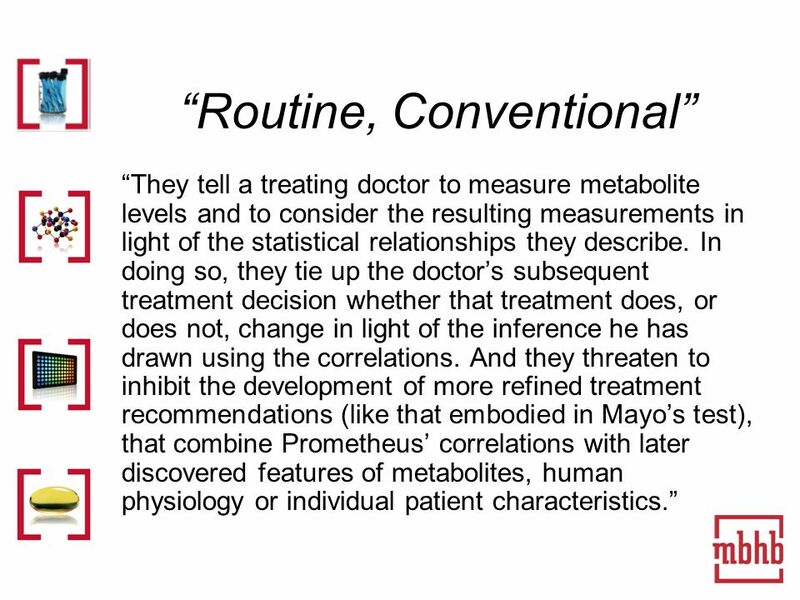 16 Routine, Conventional They tell a treating doctor to measure metabolite levels and to consider the resulting measurements in light of the statistical relationships they describe. 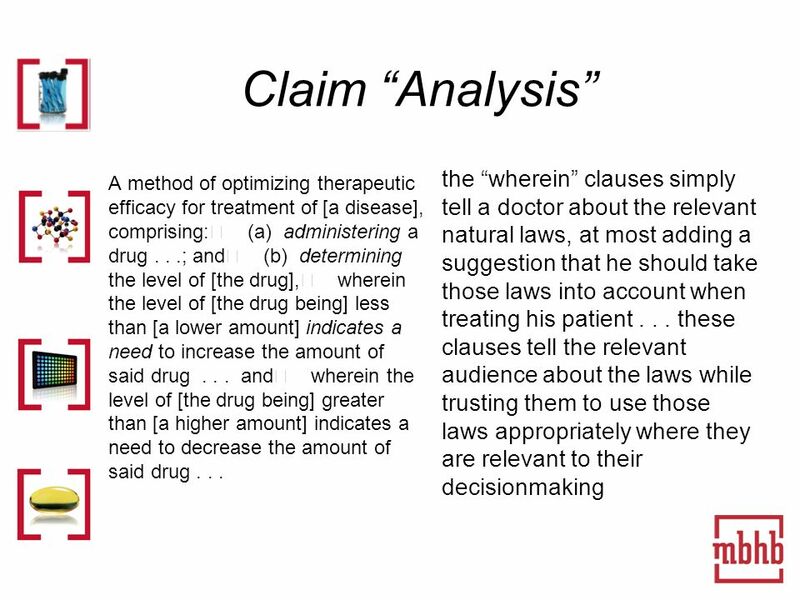 In doing so, they tie up the doctors subsequent treatment decision whether that treatment does, or does not, change in light of the inference he has drawn using the correlations. 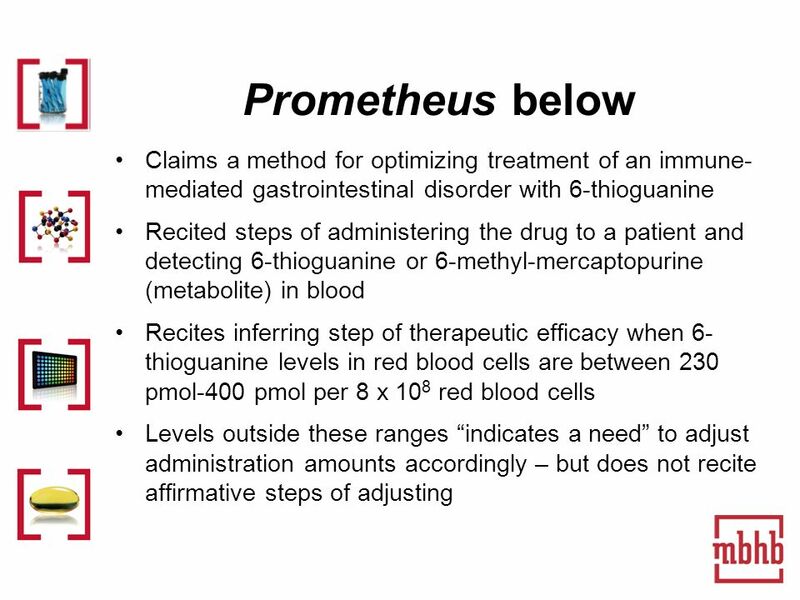 And they threaten to inhibit the development of more refined treatment recommendations (like that embodied in Mayos test), that combine Prometheus correlations with later discovered features of metabolites, human physiology or individual patient characteristics. 17 Not Enough Added The upshot is that the three steps simply tell doctors to gather data from which they may draw an inference in light of the correlations," merely "inform[ing] a relevent audience of certain laws of nature. 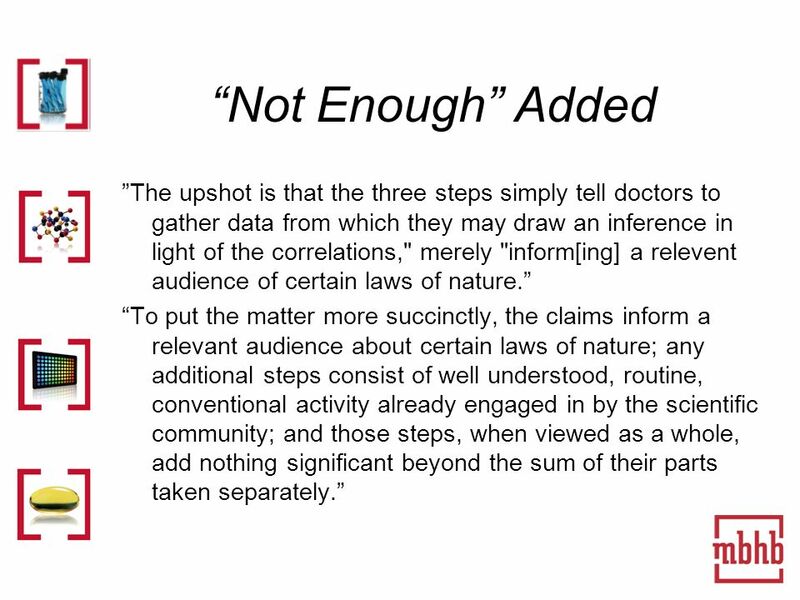 To put the matter more succinctly, the claims inform a relevant audience about certain laws of nature; any additional steps consist of well­ understood, routine, conventional activity already engaged in by the scientific community; and those steps, when viewed as a whole, add nothing significant beyond the sum of their parts taken separately. 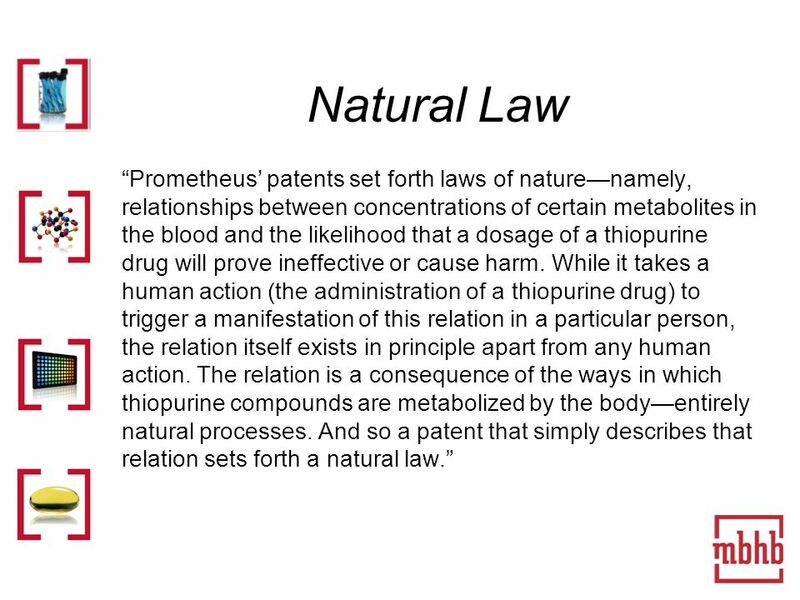 18 Natural Law Prometheus patents set forth laws of naturenamely, relationships between concentrations of certain metabolites in the blood and the likelihood that a dosage of a thiopurine drug will prove ineffective or cause harm. While it takes a human action (the administration of a thiopurine drug) to trigger a manifestation of this relation in a particular person, the relation itself exists in principle apart from any human action. The relation is a consequence of the ways in which thiopurine compounds are metabolized by the bodyentirely natural processes. 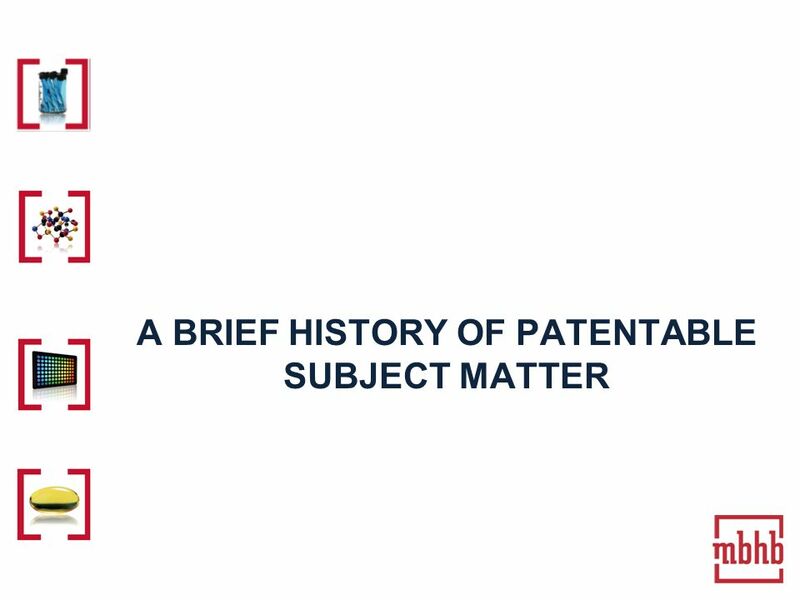 And so a patent that simply describes that relation sets forth a natural law. 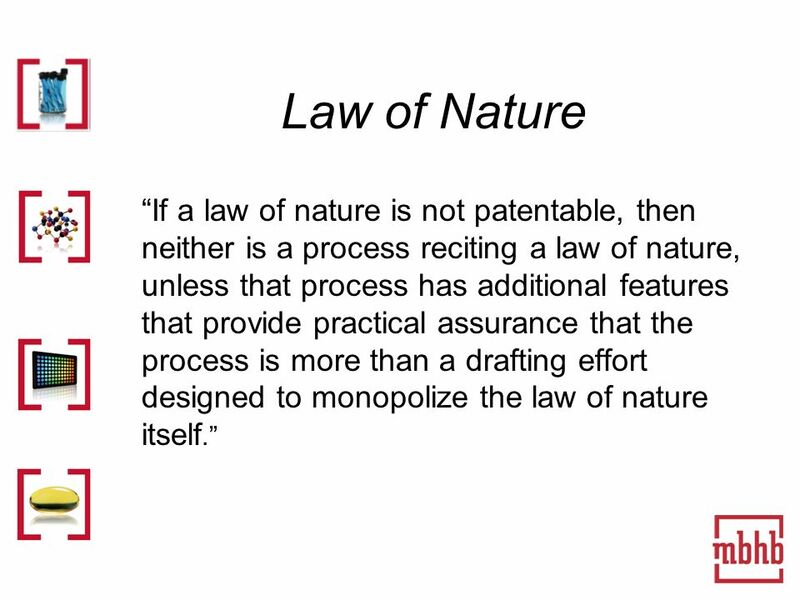 19 Law of Nature If a law of nature is not patentable, then neither is a process reciting a law of nature, unless that process has additional features that provide practical assurance that the process is more than a drafting effort designed to monopolize the law of nature itself. 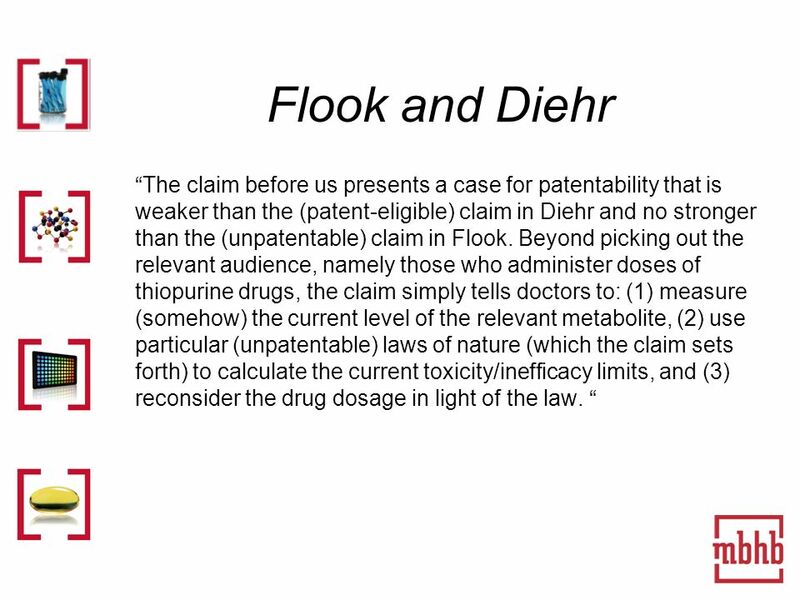 20 Flook and Diehr The claim before us presents a case for patentability that is weaker than the (patent-eligible) claim in Diehr and no stronger than the (unpatentable) claim in Flook. 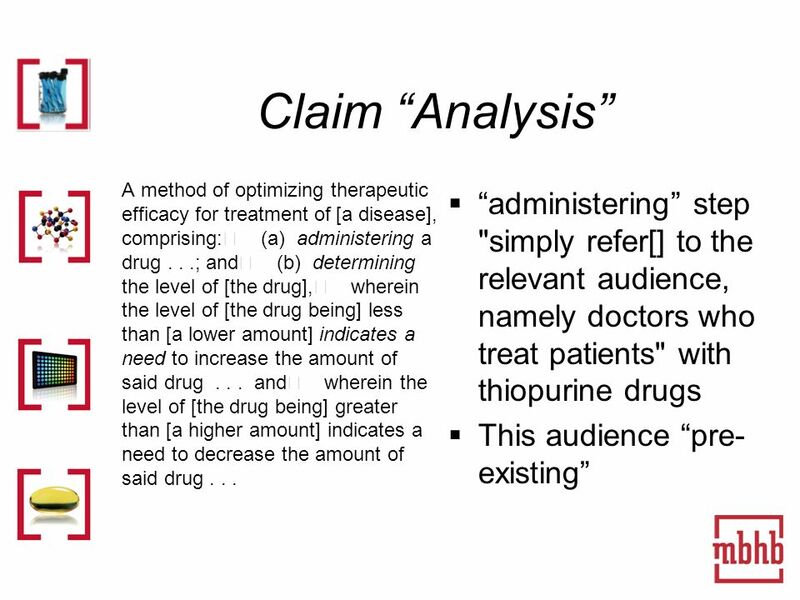 Beyond picking out the relevant audience, namely those who administer doses of thiopurine drugs, the claim simply tells doctors to: (1) measure (somehow) the current level of the relevant metabolite, (2) use particular (unpatentable) laws of nature (which the claim sets forth) to calculate the current toxicity/inefficacy limits, and (3) reconsider the drug dosage in light of the law. 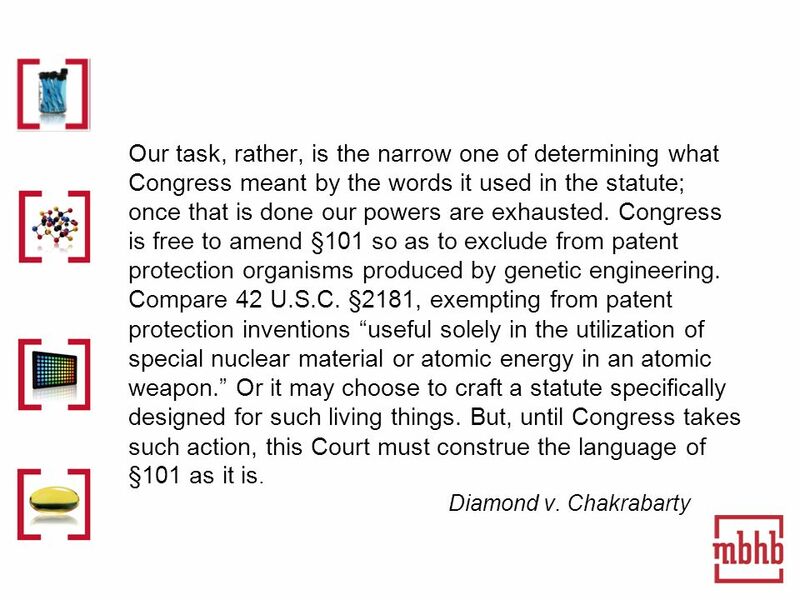 21 Example Einstein, we assume, could not have patented his famous law by claiming a process consisting of simply telling linear accelerator operators to refer to the law to determine how much energy an amount of mass has produced (or vice versa). 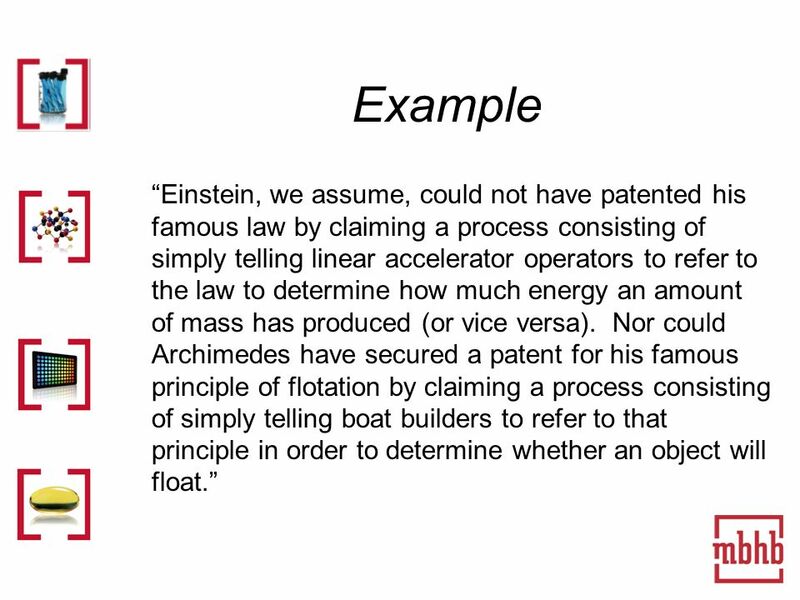 Nor could Archimedes have secured a patent for his famous principle of flotation by claiming a process consisting of simply telling boat builders to refer to that principle in order to determine whether an object will float. 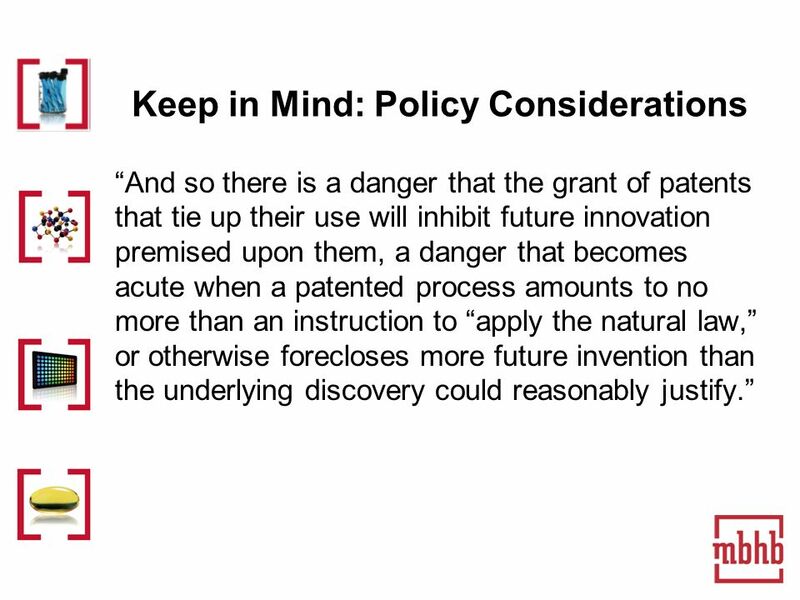 22 Keep in Mind: Policy Considerations And so there is a danger that the grant of patents that tie up their use will inhibit future innovation premised upon them, a danger that becomes acute when a patented process amounts to no more than an instruction to apply the natural law, or otherwise forecloses more future invention than the underlying discovery could reasonably justify. 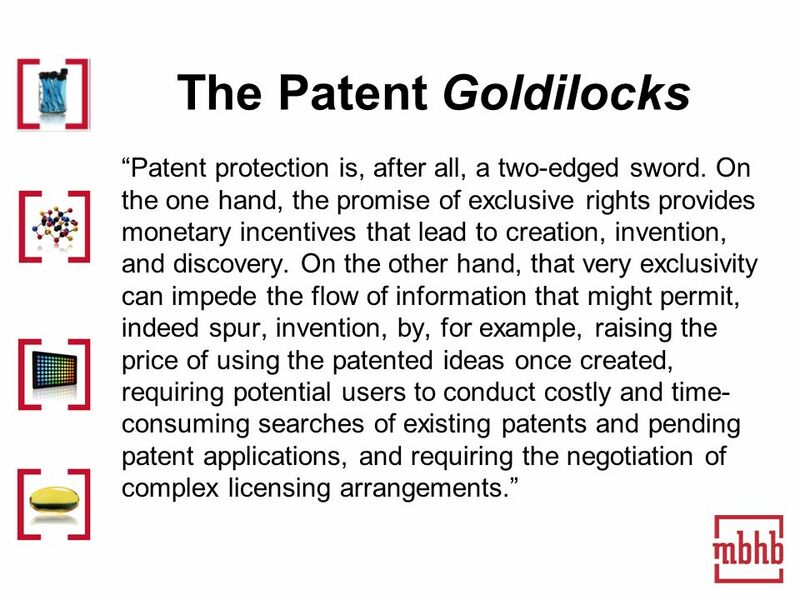 23 The Patent Goldilocks Patent protection is, after all, a two-edged sword. On the one hand, the promise of exclusive rights provides monetary incentives that lead to creation, invention, and discovery. 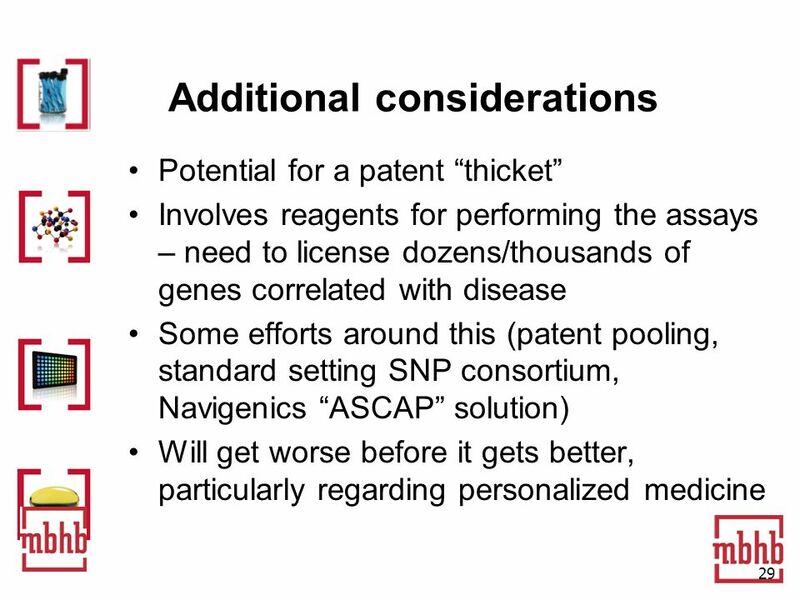 On the other hand, that very exclusivity can impede the flow of information that might permit, indeed spur, invention, by, for example, raising the price of using the patented ideas once created, requiring potential users to conduct costly and time- consuming searches of existing patents and pending patent applications, and requiring the negotiation of complex licensing arrangements. 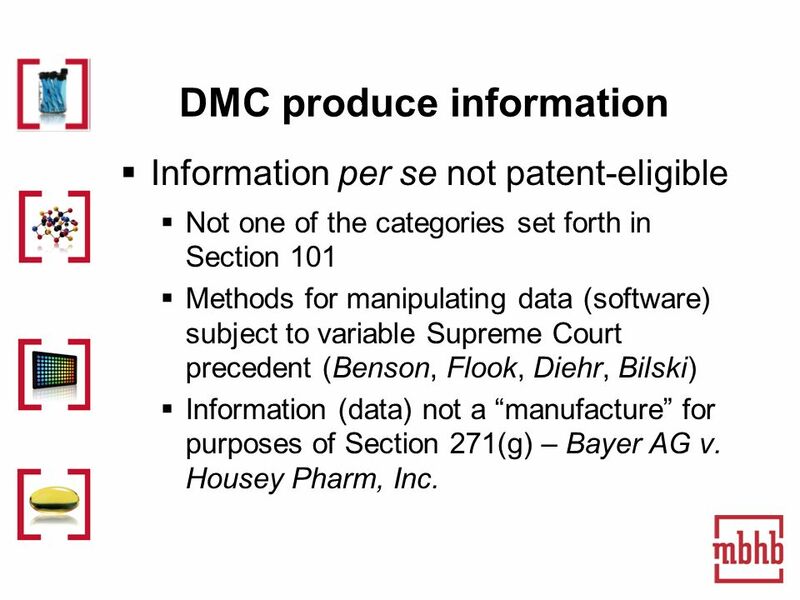 25 DMC produce information Information per se not patent-eligible Not one of the categories set forth in Section 101 Methods for manipulating data (software) subject to variable Supreme Court precedent (Benson, Flook, Diehr, Bilski) Information (data) not a manufacture for purposes of Section 271(g) – Bayer AG v. Housey Pharm, Inc.
26 Are medical DMCs different? 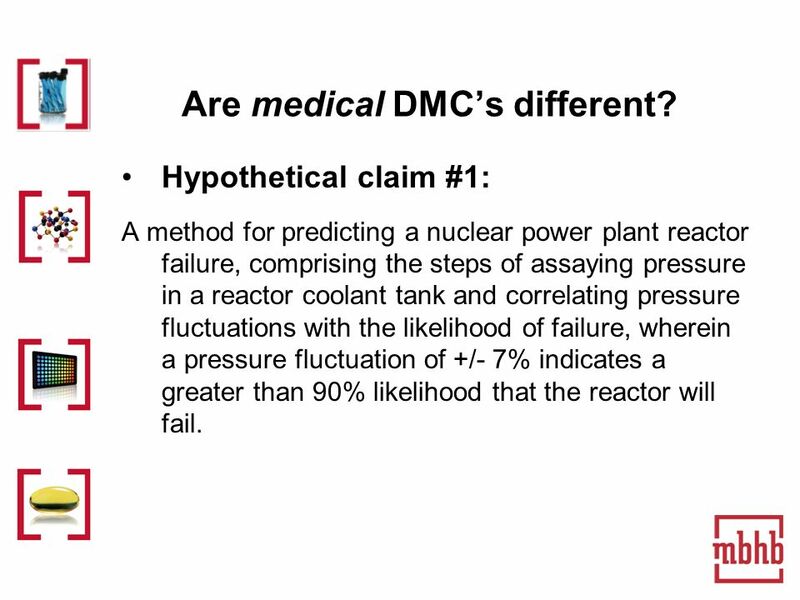 Hypothetical claim #1: A method for predicting a nuclear power plant reactor failure, comprising the steps of assaying pressure in a reactor coolant tank and correlating pressure fluctuations with the likelihood of failure, wherein a pressure fluctuation of +/- 7% indicates a greater than 90% likelihood that the reactor will fail. 27 Are medical DMCs different? 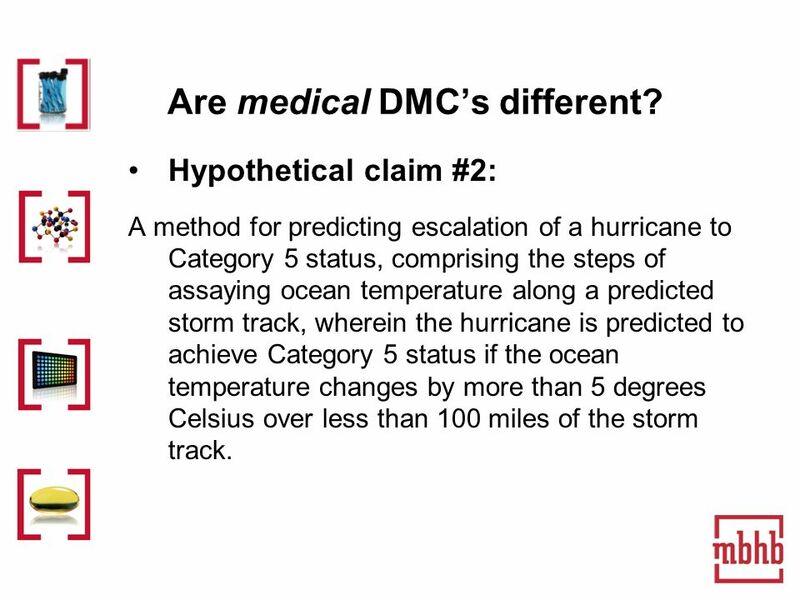 Hypothetical claim #2: A method for predicting escalation of a hurricane to Category 5 status, comprising the steps of assaying ocean temperature along a predicted storm track, wherein the hurricane is predicted to achieve Category 5 status if the ocean temperature changes by more than 5 degrees Celsius over less than 100 miles of the storm track. 28 Differences in structure or differences in application? 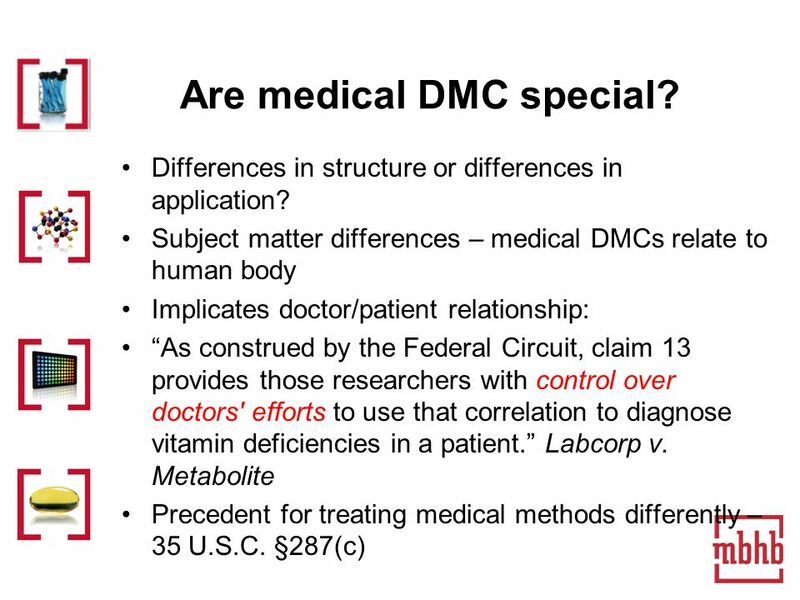 Subject matter differences – medical DMCs relate to human body Implicates doctor/patient relationship: As construed by the Federal Circuit, claim 13 provides those researchers with control over doctors' efforts to use that correlation to diagnose vitamin deficiencies in a patient. Labcorp v. Metabolite Precedent for treating medical methods differently – 35 U.S.C. 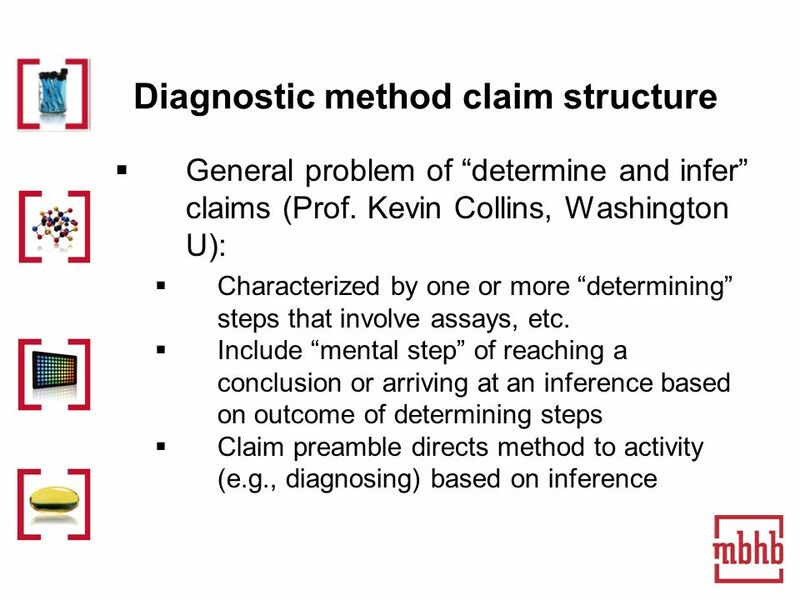 §287(c) Are medical DMC special? 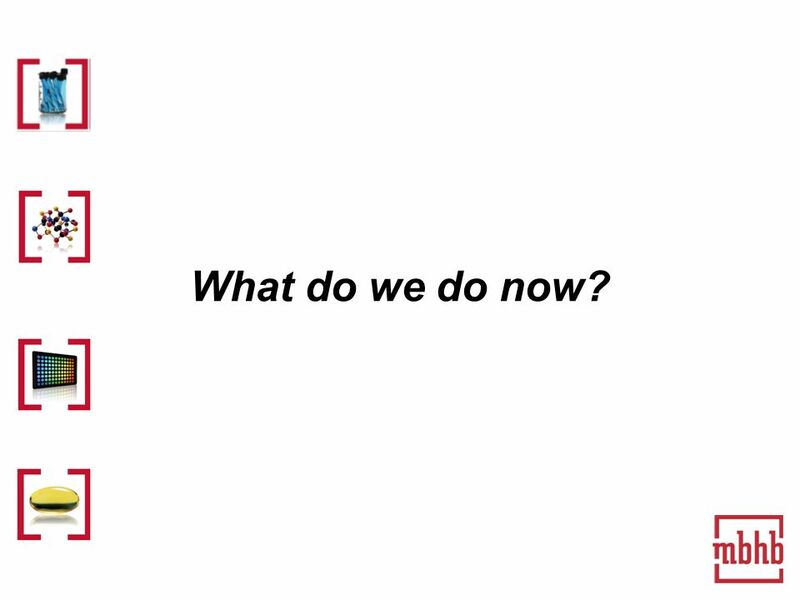 30 What do we do now? 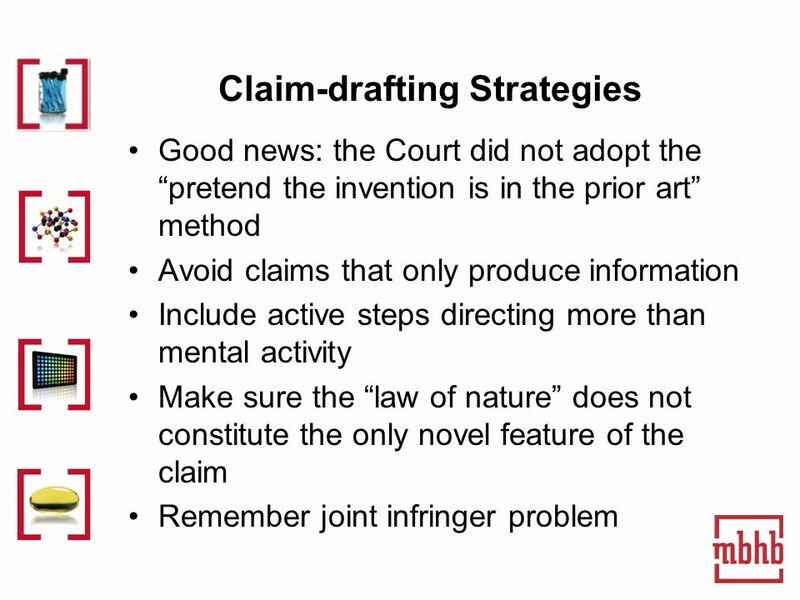 32 The culprits: patent attorneys Prior precedent "warn us against interpreting patent statutes in ways that make patent eligibility depend simply on the draftsman's art without reference to the principles underlying the prohibition against patents for [natural laws]. 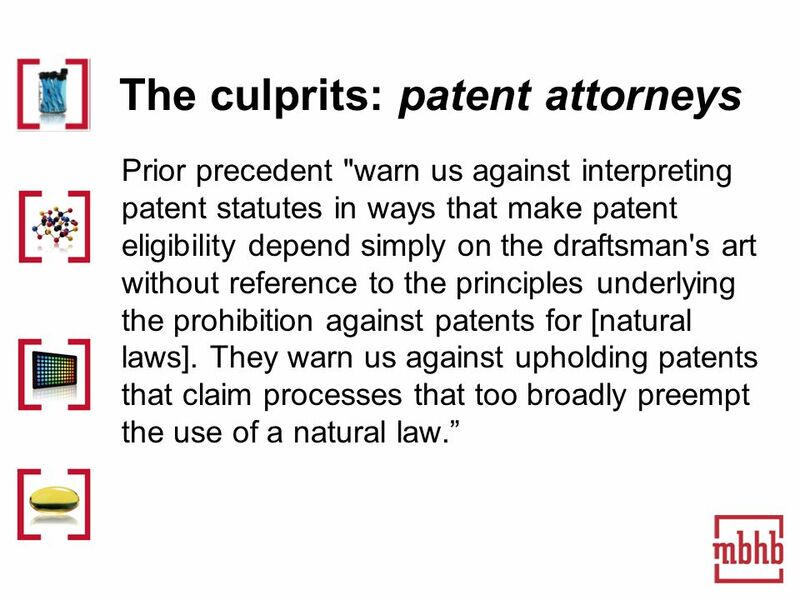 They warn us against up­holding patents that claim processes that too broadly preempt the use of a natural law. 34 Conflict in Supreme Court precedent In Diamond v. Diehr, the Court instructed: It is inappropriate to dissect the claims into old and new elements and then to ignore the presence of the old elements in the analysis. 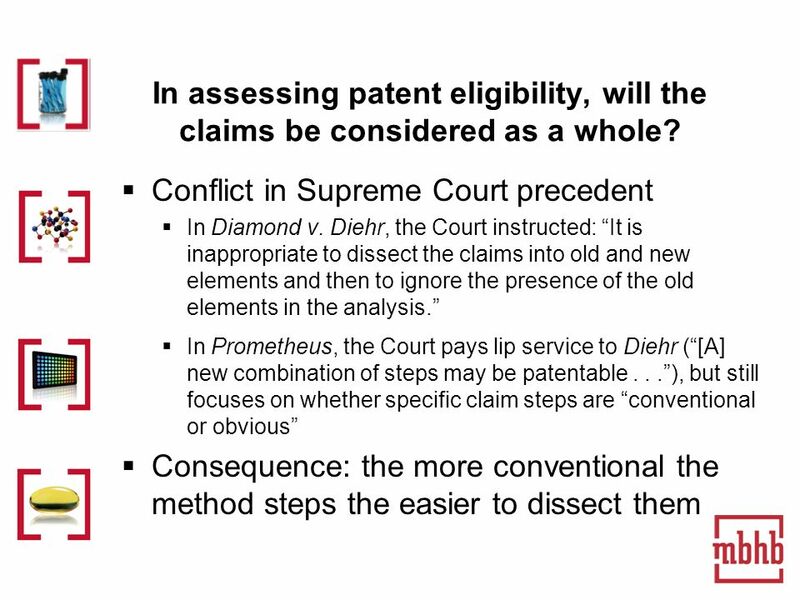 In Prometheus, the Court pays lip service to Diehr ([A] new combination of steps may be patentable...), but still focuses on whether specific claim steps are conventional or obvious Consequence: the more conventional the method steps the easier to dissect them In assessing patent eligibility, will the claims be considered as a whole? 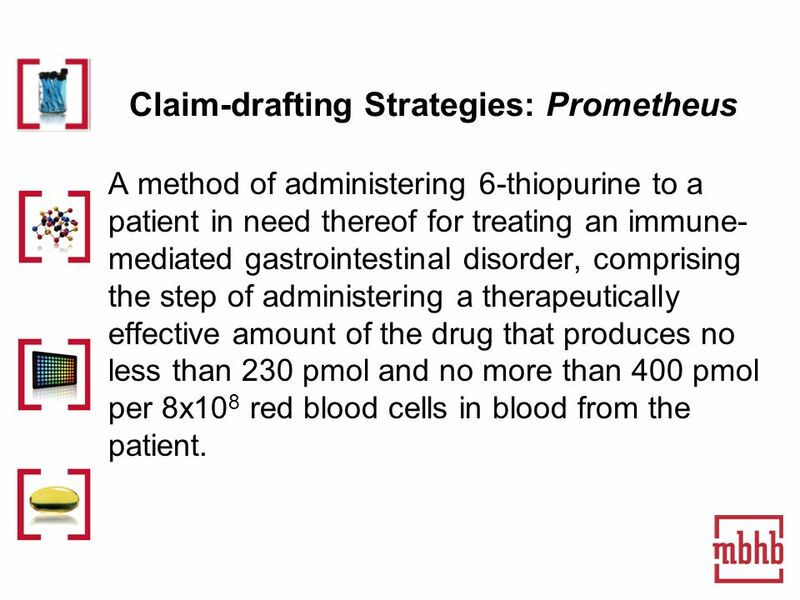 38 Claim-drafting Strategies: Prometheus A method of administering 6-thiopurine to a patient in need thereof for treating an immune- mediated gastrointestinal disorder, comprising the step of administering a therapeutically effective amount of the drug that produces no less than 230 pmol and no more than 400 pmol per 8x10 8 red blood cells in blood from the patient. 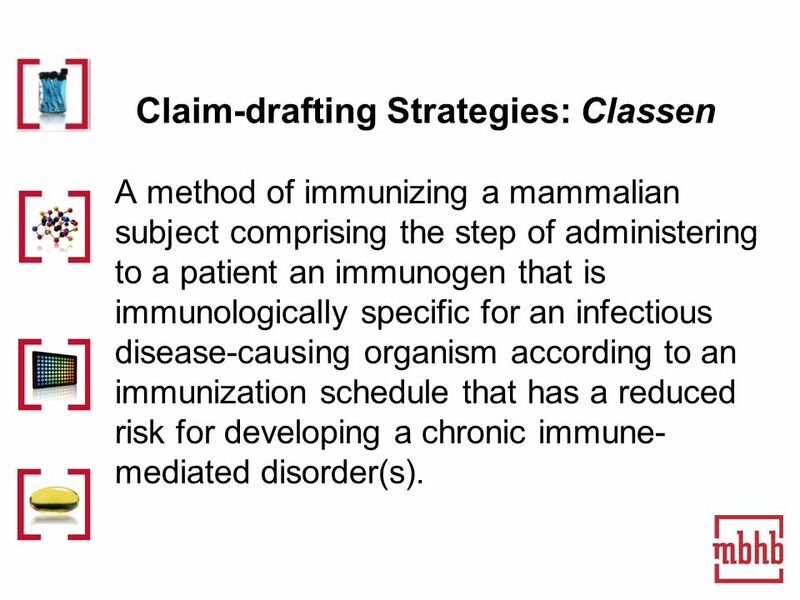 39 Claim-drafting Strategies: Classen A method of immunizing a mammalian subject comprising the step of administering to a patient an immunogen that is immunologically specific for an infectious disease-causing organism according to an immunization schedule that has a reduced risk for developing a chronic immune- mediated disorder(s). 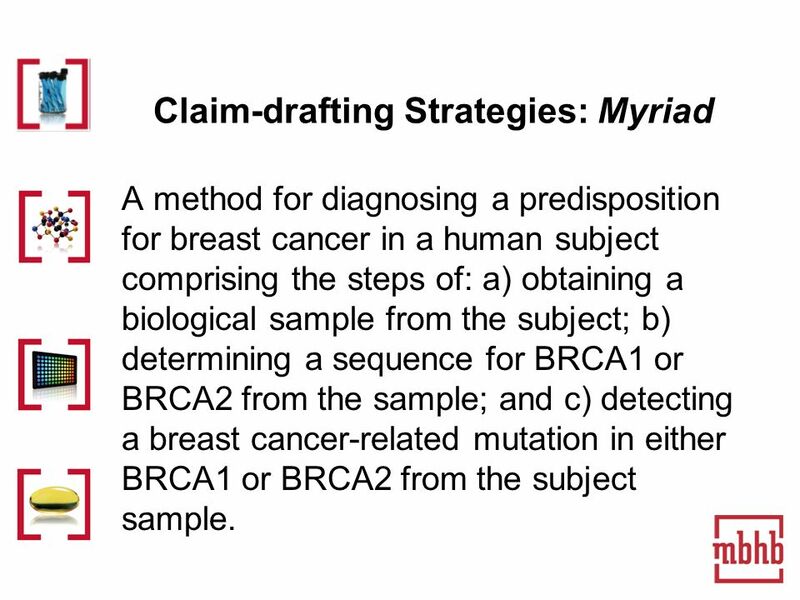 40 Claim-drafting Strategies: Myriad A method for diagnosing a predisposition for breast cancer in a human subject comprising the steps of: a) obtaining a biological sample from the subject; b) determining a sequence for BRCA1 or BRCA2 from the sample; and c) detecting a breast cancer-related mutation in either BRCA1 or BRCA2 from the subject sample. 42 [W]e must recognize the role of Congress in crafting more finely tailored rules where necessary. Cf. 35 U.S.C. 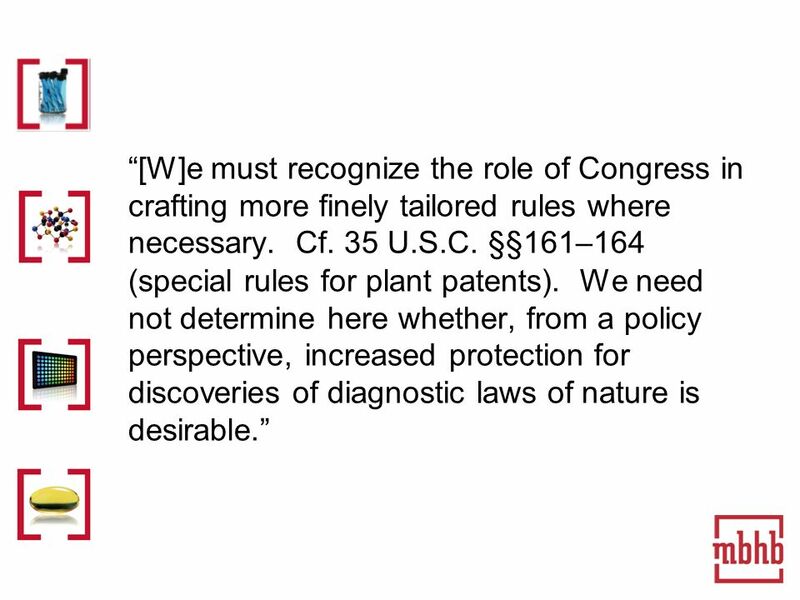 §§161–164 (special rules for plant patents). 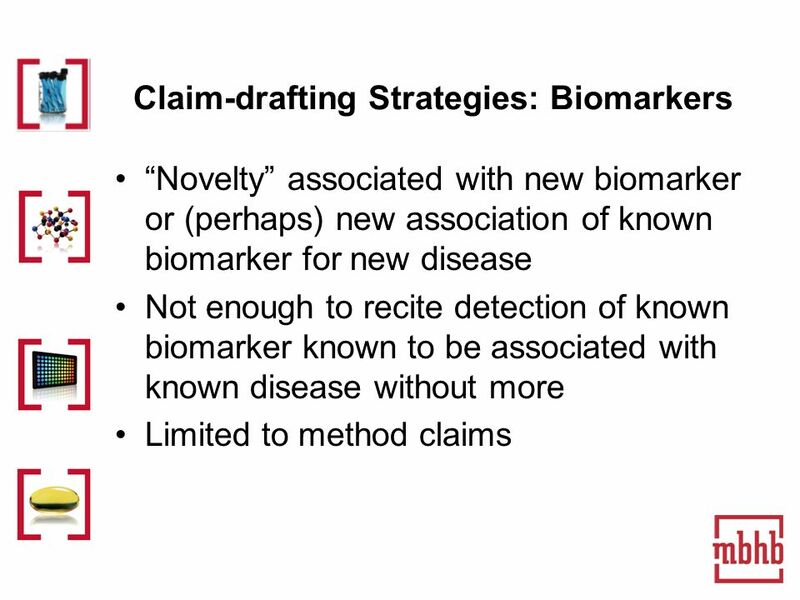 We need not determine here whether, from a policy perspective, increased protection for discoveries of diagnostic laws of nature is desirable. 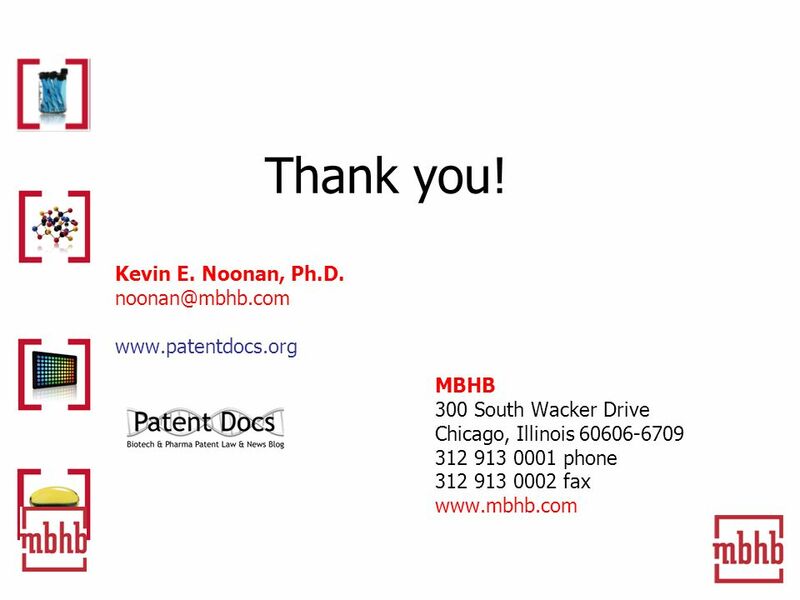 Download ppt "Navigating the Post- Prometheus World Technology Transfer Tactics Webinar May 3, 2012 Kevin E. Noonan, Ph.D."
Patent Prosecution June 2013 June 13, 2013. 1 Myriad, Metabolite, Bilski, and Prometheus: The Four Horsemen of the Biotech Apocalypse? Kevin E. Noonan, Ph.D. McDonnell Boehnen Hulbert & Berghoff. 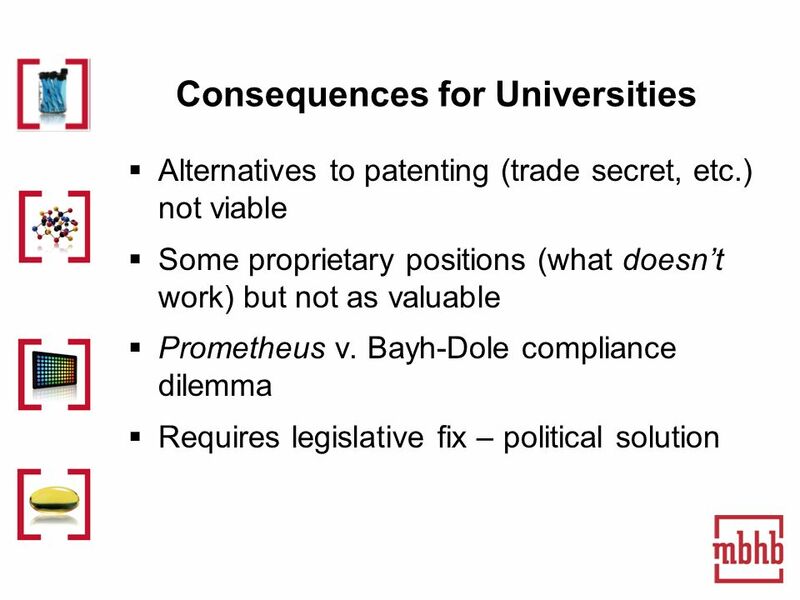 Patent Law and Policy University of Oregon Law School Fall 2008 Elizabeth A. Tedesco Patent Law and Policy, Fall 2009 Class 2, Slide 1. TJSTEL Symposium March 19, 2010 Ahmed J. Davis Fish & Richardson, P.C. The Bilski Tea Leaves: Which Way Will They Go? Mayo – The Bell Tolled or, It’s the End of the World as We Know It (And I Feel Fine) May 3, 2012 AIPLA Biotechnology Committee Webinar James J. Kelley. 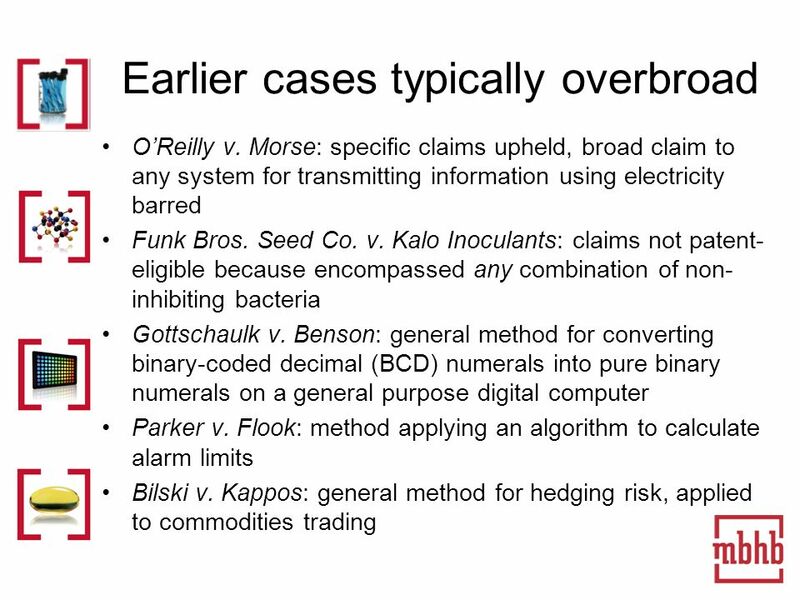 PATENTABLE SUBJECTS IN THE INTERNET OF THINGS ALICIA SHAH. 11 Post-Bilski Case Law Update Remy Yucel Director, Central Reexamination Unit. 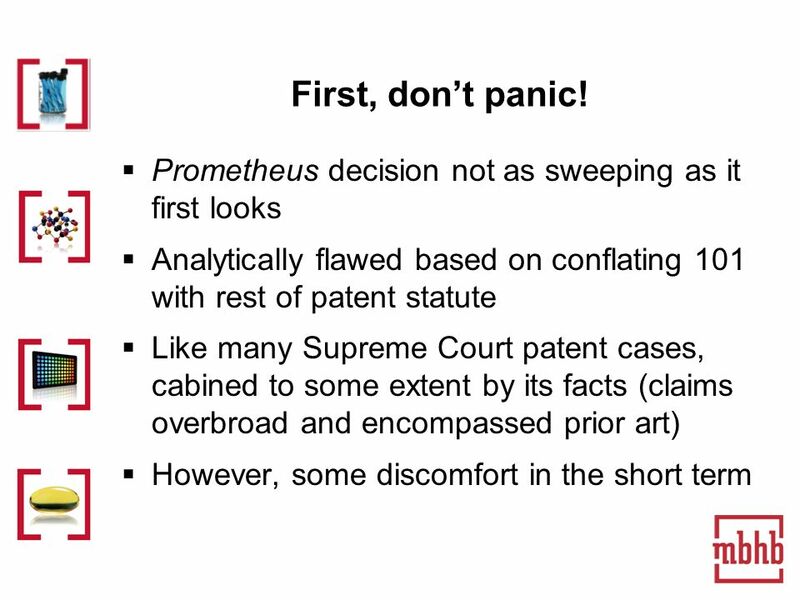 Mayo v. Prometheus Decided March 20, 2012 Roberte Makowski, Ph.D., J.D. Hans Sauer, Ph.D., J.D. 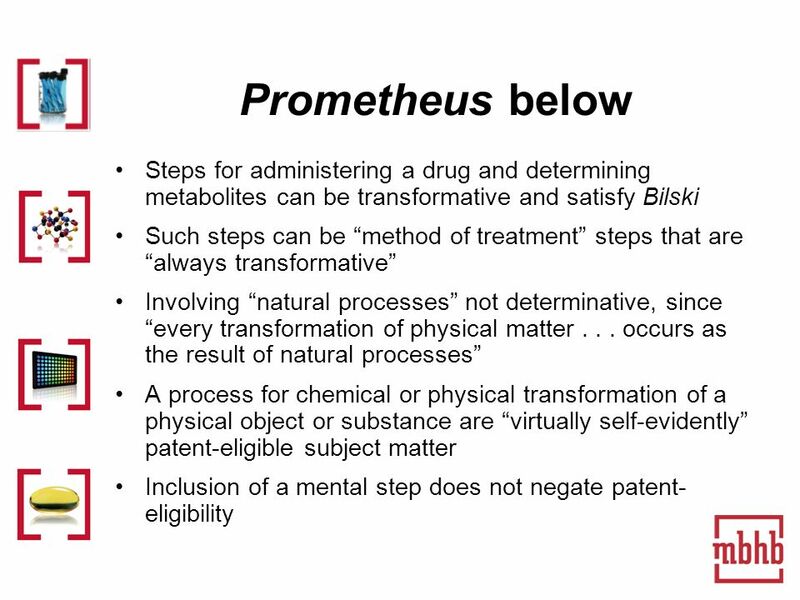 AIPLA Biotechnology Committee Webinar: Mayo v. Prometheus: Did the Bell Toll for Personalized Medicine Patents? Prof. Joshua D. Sarnoff DePaul U. College.